If you have three days in San Francisco, consider yourself lucky—it’s ample time to immerse yourself in the city’s dreamy fog, diverse neighborhoods, and far-out sophistication. After your urban adventures, there’s even time for a wine or wilderness excursion. Here are a few ways to spend three days in and around SF. Introduce yourself to San Francisco by taking a road often traveled—it’s actually quite nice. Choose a hop-on hop-off bus tour to get your bearings and explore at your own pace, or, if you’re staying downtown, catch a historic cable car at Market and Powell streets and ride over the hills to the waterfront. From the end of the line at Fisherman’s Wharf, you have options: cruises depart from the nearby piers to Alcatraz, to Sausalito, and around the bay. Combination tours save time and money by pairing a cruise with additional experiences such as a food tour or admission to local museums. Alternatively, rent bikes and ride along the San Francisco Bay Trail to the Golden Gate Bridge. Day two is for more in-depth exploration. Start with a walking tour in the Mission, a diverse district known for stellar street art and an explosive cuisine scene. The next neighborhood over is another walking tour option: the Castro, a few square blocks of LGBTQ culture with the city’s most popular historic theater. You’ll also want to journey through the Haight—home to colorful Victorians, funky boutiques, Deadheads, and visionaries—and emerge into the vast urban oasis of Golden Gate Park, easily seen in just a few hours on a Segway or self-guided bike tour. The park is also home to the California Academy of Sciences and de Young Museum, two sights best seen with skip-the-line admission tickets. Just beyond the bay lie several essential day-trip destinations. Wine lovers can spend a day in the internationally renowned Napa and Sonoma valleys, exploring by bus, train, private car, or bike, while nature enthusiasts can embark on an epic day in Yosemite, one of the US’ first national parks. Guided Yosemite tours leave San Francisco early in the morning and return after dinner, including time to revel in Gold Rush towns, hike among giant sequoias, and spectacular park highlights such as Half Dome, Yosemite Falls, and El Capitan. If you’d like more time on the coast, journey down to the Monterey Bay Aquarium and Carmel, or try a whale-watching trip out to the Farallon Islands. See the best of San Francisco in one day with this guided tour that includes all transportation. Visit multiple locations with plenty of stops for photo ops, plus take a self-guided tour to Alcatraz Island. 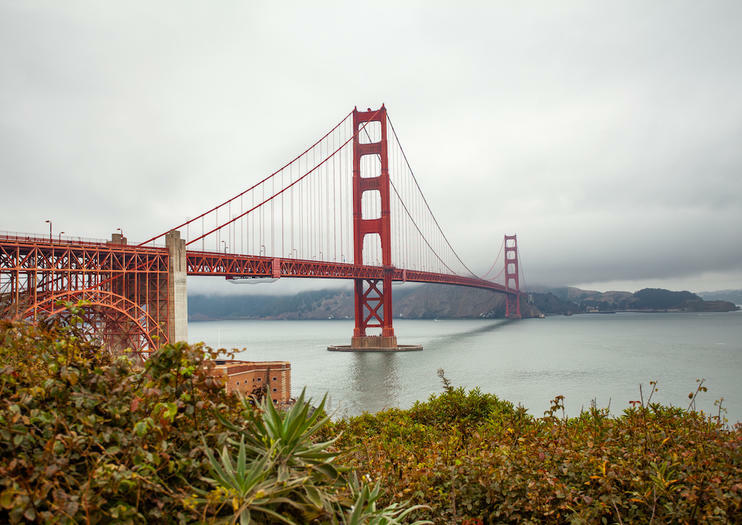 You’ll travel across the Golden Gate Bridge to see the redwood trees of Muir Woods National Monument, and listen to commentary about San Francisco's culture, history, and other places to check out on your own. Go whale watching in San Francisco on this 2.5-hour cruise that departs from Pier 39. On an eco-friendly catamaran, glide through San Francisco Bay and under the Golden Gate Bridge to reach the open Pacific, where you’ll keep your eyes peeled for humpback and gray whales, as well as marine life like dolphins and seals. Learn about the history and geology of the area from an onboard naturalist, and admire the rugged California coast. Explore one of California's most iconic settings from the beauty of San Francisco Bay. This hour-long, narrated Golden Gate Bay cruise journeys alongside Alcatraz and Angel Island State Park, past the shores of Sausalito and beneath the Golden Gate Bridge. You can choose to view the sights from inside your boat or out on deck. Enjoy easy access to the California Academy of Sciences with this skip-the-line pass. Walk right in with this pre-paid ticket to enjoy the museum's 4-story rainforest, planetarium and aquarium. Avoid wasting your precious vacation waiting in the long lines to purchase tickets for this exhibit-packed museum. Your admission includes all shows and exhibits, and is a perfect activity for families. Ride the Napa Valley Wine Train, enjoy a gourmet lunch, and tour a vineyard on this tour from San Francisco. Travel through scenic wine country on this antique train, passing through Yountville, Rutherford, Oakville and St Helena as you dig in to a 3-course meal. Disembark at Grgich Hills Estate, Charles Krug Winery or Raymond Vineyards to receive a guided tour and taste the wines for which Napa is famous. Tour San Francisco's Ferry Building on the original tour established in 2004 with a culinary expert guide, then visit Alcatraz on this full-day excursion in San Francisco. The California coastline is dramatic, iconic and rugged, but also difficult to enjoy when you're trapped behind the wheel of a car rental. So take this day trip to Carmel and Monterey, and enjoy the cliffside and ocean views from the window seat of your coach. Explore San Francisco’s beautiful Golden Gate Park on this 2.5-hour Segway tour. Led by a local guide, you’ll pass top attractions like the Japanese Tea Gardens, the de Young Museum and the California Academy of Sciences. All equipment is included, as well as a safety training. Cover even more ground on a Segway as you soak up Golden Gate Park's rich history and hidden gems from your guide. Discover a variety of delicious foods along with vibrant street art on a 2.5-hour food and art tour in San Francisco’s Mission District. Your guide introduces you to the history and culture of the neighborhood as you take in eye-popping murals along Balmy Avenue and Clarion Alley, and taste the specialties at five favorite local eateries. Expect to try gourmet donuts, Mexican pastries, agua fresca (fruit drink), sweet or savory pie, and stop at a famous taqueria before finishing up at Dolores Park and the Mission Dolores. Discover San Francisco on your own schedule with a 1-day bike rental. Visit the crooked path of Lombard Street, North Beach, Haight-Ashbury, the Golden Gate Bridge and more. This self-guided trip gives you the opportunity to create your own itinerary as you explore the beloved City by the Bay. Get a taste of San Francisco’s Mission District on this 3-hour food tour. Led by a local guide, you'll treat your taste buds to a diverse range of cuisine, from traditional Latin recipes to modern spins on local dishes. Bring an appetite for authentic tacos and Mexican delicacies, house-cured pastrami sandwiches, horchata-flavored cupcakes and more. This tour is offered along Mission in the evening along 18th Street.